Do I need a concrete slab for a MEGA STORAGE SHED building? No, in most cases. Only when your shed is to be located in an area that is below the grade of the rest of your yard should a concrete pad be considered for extra height and drainage. If your intended use for the building requires a concrete floor due to the weight or type of materials to be stored in it, a concrete pad may be ordered from a professional contractor. Call 281-513-1956 to discuss site specifications with one of our expert sales consultants. No. All of out shed buildings include on-site installation by trained building installers at no additional cost. All material and construction costs are included in the base price, except for concrete slabs or footings and work done outside the normal installation process such as hauling away an existing structure or debris, site leveling, etc. Fees relating to engineered drawings, permits and in some cases, local delivery also may apply. Any such additional costs are clearly detailed for customers by their sales consultant upon placing an order. We use durable and solid, premium SmartPanel plywood siding with a 30-Year Limited Warranty. The siding is real plywood with a hardboard exterior surface. Compare this robust Â½” thick material to the 3/8″ particleboard siding used in typical shed construction. We offer standard 25 yr shingles in various colors. However the homeowner has the option to upgrade to 30-yr shingles with an additional cost. Delivery times typically vary between 1 and 2 weeks due to seasonal demands and whether or not your building will require permits or additional engineered drawings. Typically, smaller storage buildings do not require permits or any additional engineering, but larger and more custom buildings and garages are more likely to require additional preparation time prior to starting construction. Consult with your local expert sales consultant to discuss preparation; whether or not permits are required, scheduling and estimated duration of the job once it begins. Your personal schedule and your site preparation are important factors in determining the actual delivery and build dates. Build days are Monday thru Saturday, except holidays. We ask that someone over the age of 18 be at home on the day of the build to help confirm the exact location of the building and sign the final paperwork upon completion. For installation of storage buildings, you can typically expect the builders to finish and clean up the job site in less than a day’s time (8 hours). Garages and large custom buildings can take considerably longer, depending on the scope of work involved. 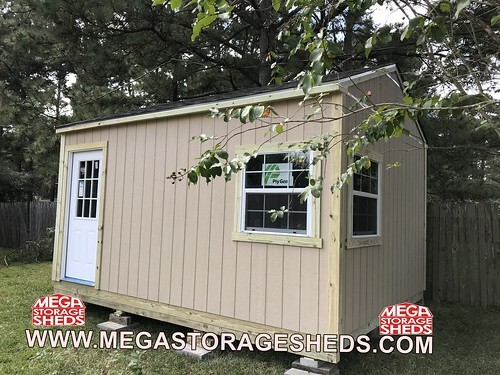 For these custom projects, be sure to call MEGA STORAGE SHEDS about projected start dates and completion schedules. YES!!! Mega Storage Sheds is proud to announce that we now offer financing, which is done through a third party. For more information or fill out an application please contact us. This depends on the local building department regulations and what they have determined as the square foot limitations for on-site buildings within their jurisdiction. The customer is responsible for obtaining and paying for any required permits. Garages and larger custom buildings almost always require a building permit. Smaller storage sheds and sheds installed on rural building sites are less likely to require permits. Permit regulations vary according to location, and the customer should consult with the local governing body in the area where the building is to be constructed. Additionally, there may be neighborhood covenants regarding acceptable building size, style, height, location, etc. that must be considered by the customer as well. What should I do before the delivery? Research and be able to provide compliance to any and all neighborhood covenants and obtain the required permits. Then determine where your property lines are, and select an appropriate building site. You are responsible to select a location for your building that is within your property lines and in conformity with any applicable set back rules or regulations. Finally, you need to prepare a “clean and level” build site. This step is the most important and lasting impact that you can have on your building project. It is best if the site is located in a high spot of the yard to provide drainage away from your shed. If you have to “build up” a site be sure that the soil is tamped or compacted to avoid later settling. Provide at least 24″ of workspace between your shed and any fences, trees or other immovable objects, on all sides and above. If your build site is not clean and level, our only choice is to “shim” the foundation with concrete blocks and shims that can detract from the appearance of your shed. What does “clean and level” mean? “Clean” means that the build site, the surrounding area and the pathway to and from where the delivery vehicle parks and the build site are clear and free from all obstructions, debris, boulders, branches, animal droppings, etc. To attain the maximum performance from your building, the structure needs to be built on a “level” site. For our building construction purpose, “level” is defined as the entire build site surface being leveled to within 4″. This means that throughout the entire build site surface, the highest point to the lowest point is no more than 4″. What type of warranty comes with the building? All options are covered under the warranty-window, ramps, shelves, lofts, etc. How is Mega Storage Sheds different from competitors? Our prices are the BEST in the market! We build quality sheds at an affordable price! Unlike the structures sold by national companies, ours are built on site. Our provide customers the ability to add on extra options. Can my shed be wired for electricity and plumbing? Yes, we can provide electrical wiring, plumbing, insulation, drywall, trim, and paint services. Making it perfect for a a home office man cave, mother in law suite or any other use. Does the price include the floor? 2″ x 4″ pressure treated floor joists 24″ O.C. How long will the construction of my shed take? General construction time is one day to one day and a half, depending on the size, extra options and weather permitting. We offer all styles and sizes. No size is to small or large, contact us for more information. 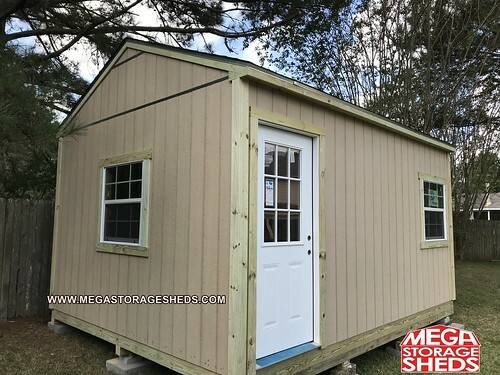 What makes Mega Storage Sheds different? We provide high quality products at the best possible prices. We have a physical office with actual displays. If in the future you have a warranty issue with our product, call us during business hours or feel free to send us an email. Be careful of businesses that do not have an actual location or change their name regularly. For your peace of mind we are BBB approved, we are the ONLY A+ rated family owned shed company. Free delivery up to 50 miles from Houston. Does the shed come painted? No, we can assist you with the paint process for an extra fee. All of our storage sheds come with primed and treated siding ready for paint. We highly recommend that your shed be completely painted within 20 days of installation or a minimum of ALL visible trim should be completely painted in order for warranty to be effective. What are the advantages with sheds built by Mega Storage Sheds vs. Other companies? We believe our sheds and buildings are built stronger, due to many reasons. The first and most obvious is with prefabrications. With prefabs, the walls and rafters are preconstructed and then delivered to the customer. This method makes prefabs inherently weak. Bending and twisting of the walls and rafters can occur during transit. Our construction is entirely onsite. We cut all the material and construct all the joists, walls, rafters, roof, siding, trim, etc., at your location, ensuring an extremely strong building. Another reason, customer select us over store branded sheds, is price and quality. At half the price, customers receive twice the quality in specifications without needing to pay an upgrade fee.